I am lucky to live in a cherry growing region. Every few years I restock my supply of sour cherries for making pies, cobblers, and jam. This isn’t so much a recipe as it is a method, but I thought I would post it so family and friends would know how much fruit to freeze and how to prepare it. I buy a 25 lb. bucket of pitted sour cherries from a local cannery that comes with a 5 lb. bag of sugar added to it. (If you have either a sour cherry tree or a source of fresh sour cherries and want to freeze some, add roughly 1/2 cup of sugar per pound of pitted cherries with juice.) Stir the cherries and sugar together until the sugar has dissolved. Measure out 3 cups of cherries with some of the juice and place in a quart ziplock bag. Squeeze out the air and seal. Wipe the bag with a damp paper towel. Label the bag with the amount of fruit and the date. Repeat until you have used all the cherries. You should have roughly 18 bags for 25 pounds of fruit. Each bag is enough for 1 (9-inch) sour cherry pie. In the past, I have had the unfortunate experience of leaky bags dripping cherry juice all over my freezer. 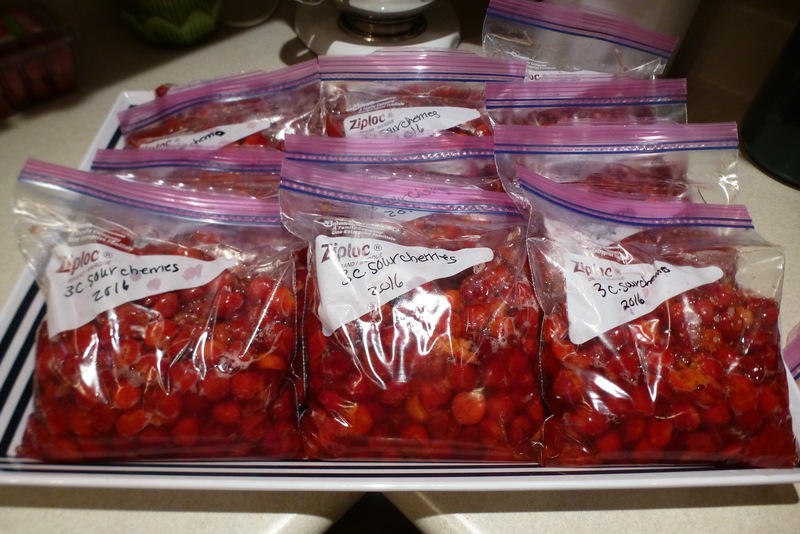 Now I take 4 quart bags filled with cherries and lay them flat in a 2 gallon ziplock bag and freeze them inside that larger bag. No more leaks. They also take up less room in the freezer using this method, and there is also less freezer burn. This entry was posted in Desserts, Fruit, Pies, preserving. Bookmark the permalink.